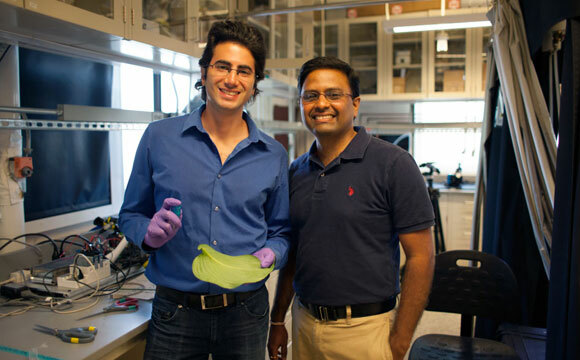 A team of researchers, including graduate student Maher Damak (left) and associate professor of mechanical engineering Kripa K. Varanasi, have found a way to drastically cut down on the amount of pesticide liquid that bounces off plants. Researchers from MIT have found a way to make pesticides stick to leaves instead of bouncing off, helping to reduce runoff pollution. When farmers spray their fields with pesticides or other treatments, only 2 percent of the spray sticks to the plants. A significant portion of it typically bounces right off the plants, lands on the ground, and becomes part of the runoff that flows to streams and rivers — often causing serious pollution. But a team of MIT researchers aims to fix that. The new approach uses two different kinds of additives. The spray is divided into two portions, each receiving a different polymer substance. One gives the solution a negative electric charge; the other causes a positive charge. When two of the oppositely-charged droplets meet on a leaf surface, they form a hydrophilic (water attracting) “defect” that sticks to the surface and increases the retention of further droplets. When the MIT team began studying the problem of pesticide runoff, which is a major agricultural problem worldwide, they soon realized that part of the reason for the limited success of earlier attempts to address the problem was that the droplet bouncing happens so quickly, in a matter of milliseconds. That means that most countermeasures, especially those based on chemical properties, just didn’t have time to make much of a difference. “So we thought, what else can you do? And we started playing around with charge interactions,” Varanasi says. 1 Comment on "MIT Researchers Help Reduce Runoff Pollution by Making Spray Droplets Less Bouncy"
Just what we need , toxins that can’t be washed off so you ingest more. Why not just grow cancerous tumors and sell them like apples?